The only sweets I know to make are the baked ones. And I make quite a lot of those! I love cookies and my father loves it even more. The best thing about cookies is that you can make the dough ahead and freeze them. You just need to take them out and bake them, that’s all. My decorating skill isn’t the best, I can hide them better in a cake, but cookies are a different matter altogether. 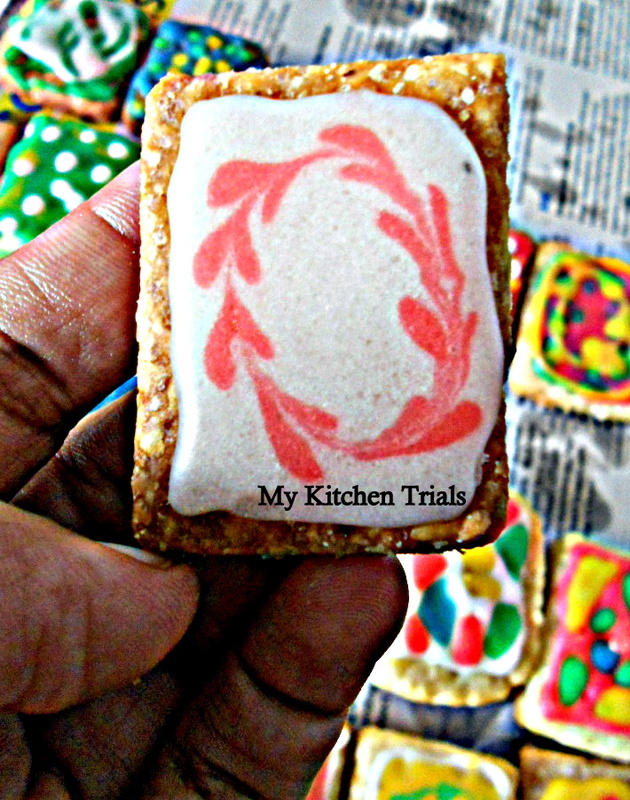 I have been planning to create Aparna’s ’tile cookies’ and the ‘flower puzzle cookie’ for a long long time now. Finally I got around doing them, but it didn’t come out great. Another time, may be! Sending these colourful cookies to Valli’s Kid’s Delight, for this month’s theme of Festival sweets. This post also goes to Blogging Marathon 34. Check out the Blogging Marathon page for posts from fellow participants. Makes : a lot of cookies! Whisk the flours, baking powder and salt in a big bowl. In a small bowl, beat the sugar and butter until light and fluffy. Add the vanilla and the milk and beat again. Add the butter mix into the dry ingredients. Mix until the dough comes together using a wooden spoon or your hands. Add a spoon of milk if the dough doesn’t come together and a spoon of flour, if the dough is sticky. I usually refrigerate the dough for half an hour before rolling them out and cutting cookie shapes out of them. Bake in a preheated oven at 180C for 10-20 minutes, depending on the size of cookies. Keep an eye on them once you reach the ten minute mark. Let them cool in the baking tray for 5 minutes and then move to a cooling rack and let it sit until completely cooled. Sift the sugar and corn flour and mix everything else for the icing. Add colors as required. Use a ziplock cover as a piping cone, cut a very tiny hole and start decorating!! 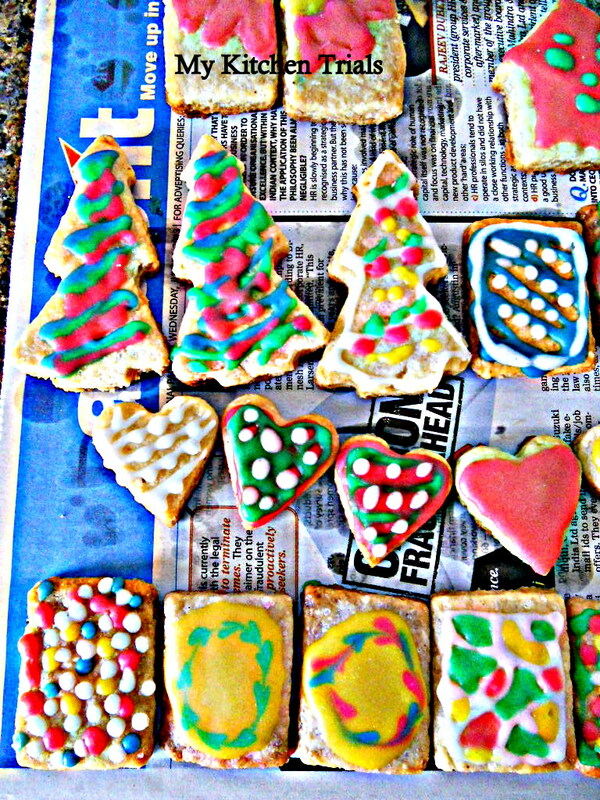 Colorful n cute cookies!!! your decorating skills are way better than mine!!! You decoration skills are not that bad. You did a pretty good job with the cookies. 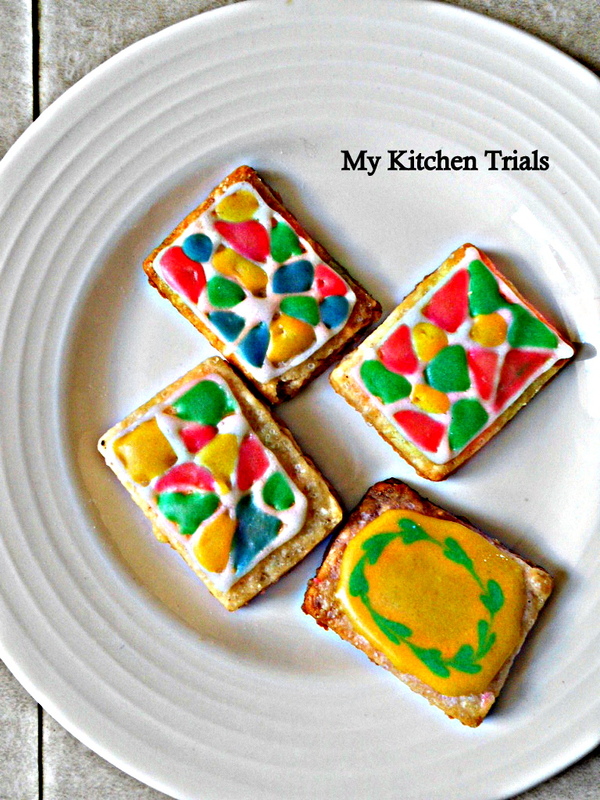 I have Aparna’s tile cookies bookmarked since she posted them years ago. Yours came out very good. Not sure when I’ll give them a try. I need to gather all my creativity to make them. A great job Rajani! I am sure the kids will love them.